PT Elnusa Tbk - Elnusa is a trusted public-listed energy services company in Indonesia. Based in Jakarta, Elnusa has its business activities focused in three sectors: Integrated Upstream Oil & gas Services, Upstream Oil & Gas Support Services and Downstream Oil & Gas Services. Elnusa was formed on 25 January 1969 and originally registered as PT Electronika Nusantara. The name PT Elnusa was launched on 9 September 1969. In February 2008, Elnusa conducted its initial public offering (IPO) on the Indonesia Stock Exchange (IDX) and its shares are traded on IDX under stock code ELSA. 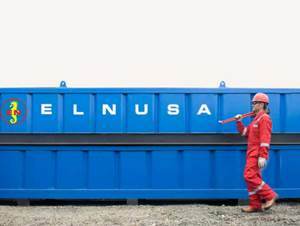 At present, Elnusa is 41.10% owned by PT Pertamina (Persero), the national oil company of Indonesia. The remaining 58.90% shares in Elnusa is owned by Pertamina Pension Fun, and Public, 43.86%. Elnusa now has 8 subsidiary/affiliated companies; PT Elnusa Geosains Indonesia, PT Elnusa Oilfield Services, PT Patra Nusa Data, PT Sigma Cipta Utama, PT Elnusa Fabrikasi Konstruksi, PT Elnusa Trans Samudera, PT Elnusa Petrofin, and PT Elnusa Patra Ritel. In term of financial performance, Elnusa recorded a satisfiying financial result in the first half of 2016 (1H 2016, ended in 30 June 2016). Elnusa booked total comprehensive income for the period of Rp 145.87 billion in the first half of 2016, according to PT Elnusa Tbk Financial Report Audit June 2016 as cited by JobsCDC.com. This total comprehensive income figures up 8.10% from Rp 134.93 billion from the same period last year. Minimum Diploma in Electrical/Electronic Engineering, Mechanical Engineering, Mechatronic/Electromechanical Engineering or equivalent. Minimum 10 years of prior experience in Marine Seismic Vessel, Mechanical Department, or equivalent experience in a directly related field plus familiarity with equipment and procedures. Have a good understanding of all the systems within the Mechanical Department, working knowledge of hydraulics, compressors, high-pressure air transfer systems and diesel/electric motors. Minimum Bachelor in Computer Science, Information Technology or equivalent. Minimum 3 Year proven work experience as Web programmer or developer. Attention to detail, strong communication skill and able to work in a team. Have a good project management skills within a fast-paced work environment. Minimum Diploma in Geophysics, Computer Science, Electronic Engineering or similar. Minimum 10 years of experience in the Acquisition Department, or equivalent experience in a directly related field plus familiarity with Positioning equipment and procedures. Have a good understanding of electronics and all the systems within the Acquisition Department. In depth knowledge of the on board Quality Control system. Have a good understanding of, and ability to interpret seismic QC products. Minimum Bachelor in Mechatronic/Electromechanical Engineering or equivalent. Minimum 10 years of experience in Marine Seismic Vessel, Positioning Department, or equivalent. Previous experience in a directly related field plus familiarity with marine seismic equipment and procedures. Have a good understanding of survey and geodetic principles. Have a good understanding of Seismic Positioning system. Able to fault find on equipment. Minimum Bachelor in Finance, Accounting, Banking or equivalent. Minimum Bachelor in Computer Science/Information Technology or equivalent. JobsCDC.com now available on android device. Download now on Google Play here. Please be aware of recruitment fraud. The entire stage of this selection process is free of charge. PT Elnusa Tbk - Recruitment D3, S1 Fresh Graduate, Experienced Elnusa April 2017 will never ask for fees or upfront payments for any purposes during the recruitment process such as transportation and accommodation.